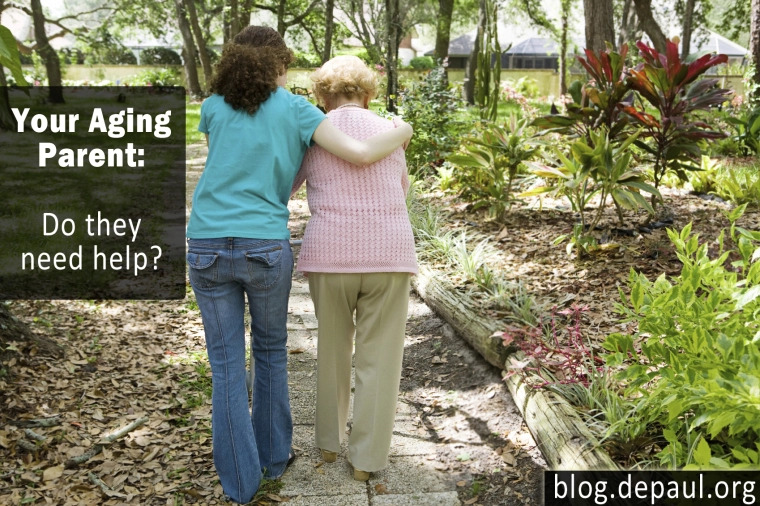 DePaul > Blog > Stories of Hope > Your Aging Parent: Do They Need Help? When your parent or loved one reaches a certain age, his/her health, mobility, and general well-being may begin to decline. As much as you may want to, you may not be able to provide the care he or she needs, especially on a daily basis. MYTH #1 – Mom eats well. TRUTH – Mom can no longer stand and prepare meals. She eats cereal, crackers, bread, and jelly; things that she doesn’t have to cook. She does not like the home delivered meals you have arranged for and seldom eats them. MYTH #2 – Dad does a good job of taking care of his personal hygiene. TRUTH – It has become too difficult to get in the tub or shower without assistance, so Dad takes sponge baths. He cannot lean over to wash his hair, and can only do it when you are free to help. He forgets to clean his dentures or just doesn’t bother to put them in. MYTH #3 – Mom still manages the laundry. TRUTH – It is easier to wear the same things time and again than to wash them. Bed linens and towels are too heavy to launder without help. Spots on clothes are harder to see and easier to ignore. MYTH #4 – Dad knows where everything is in his apartment. TRUTH – Things are being constantly misplaced. Eyeglasses, bills, the TV remote, even food items seem to turn up in the strangest places. MYTH #5 – Mom sees friends and attends worship services and social activities. TRUTH – Mom seldom leaves home, cannot hear too well and does not like to talk for very long on the phone. She spends her days alone with the television. MYTH #6 – Mom changes her bed linens once a week. TRUTH – The bed is much too difficult to change, so Mom simply ignores the soiled linens or sleeps in a chair. MYTH #7 – Dad takes all his medicines correctly. TRUTH – Dad often forgets to take medicine or takes it too often. Directions on the bottles are written too small for him to read, so he guesses at the dose. MYTH #8 – Mom is warm enough. TRUTH – The house is cold, but Mom does not want to run the heating bill up, and she can’t read the thermostat anyway. MYTH #9 – You are available whenever Dad needs you to help. TRUTH – You have a family of your own and are trying to sandwich care in for all of them and your parent too. You are exhausted. MYTH #10 – Mom is happy and wouldn’t have things any other way. TRUTH – Mom is lonely and sometimes frightened by the problems of advancing age. She will not tell you these things because she thinks you have enough to worry about already. If you have additional myths and/or truths to add, please leave a comment down below. We would love to hear about your experiences with an aging parent or loved one.